U.S. National Sled Hockey athletes turn disabilities into success – Live! Starring ... You! LSY! 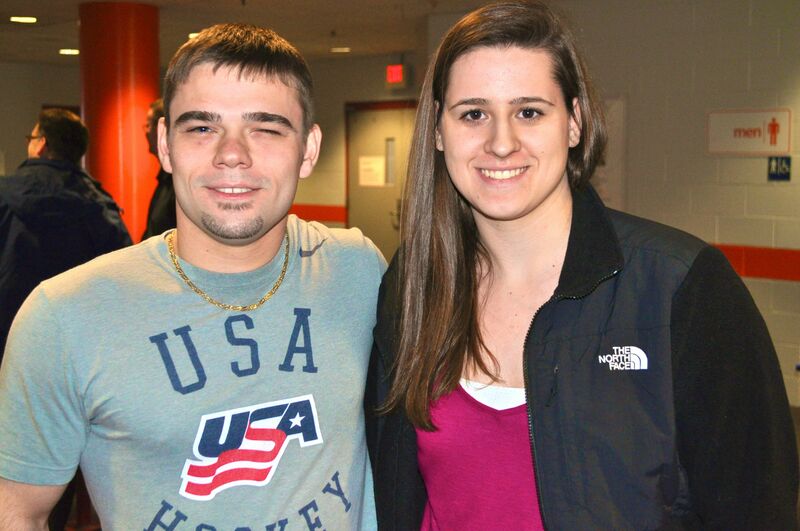 teen features editor Natalie Brophy with U.S. National Sled Hockey Team member Alexi Salamone. Have you ever met someone with a physical disability that made that person “different” from others? Have you ever thought about how you would act if you were in his or her place? Would you feel sorry for yourself, or would you go out there and do something great? The members of the U.S. National Sled Hockey Team all turned their disabilities into a success! Live! Starring…You! had the opportunity to talk with three members from the national team: Alexi Salamone, Adam Page, and Paul Schaus. They talked about what sled hockey is like and also some of the challenges they’ve faced because of their disabilities. “It’s given me the opportunity to be around guys just like me and it’s given me the freedom to play the sport I really love,” said Adam, who was born with spina bifida, which affected his legs. Alexi was born in the Ukraine shortly after the nuclear explosion in Chernobyl, Russia. As a result, he had to have both of his legs amputated when he was 4 years old. Paul was wounded in Afghanistan in 2009 and had to have both of his legs amputated. Sled hockey is basically just like skating hockey. The biggest difference is that the players are sitting down in their sleds and that they use two sticks with picks on them to move around on the ice. On the other side of the sticks are the blades used to hit the puck. Other than that, the rules are all the same. The U.S. National Sled Hockey Team has had a lot of success over the past few years, winning many international championships as well as the gold medal in the 2010 Paralympics in Vancouver, Canada. Adam and Alexi were both on the team that won gold and Alexi credits the team’s success to their relationship off the ice. “If it wasn’t for those little times together we wouldn’t be the team that we are on the ice,” he said. LSY! teen sports editor Hailey Rose Gattuso with U.S. National Sled Hockey Team member Alexi Salamone. Off the ice, the guys don’t think of themselves as different from their friends and peers. Of course there are times when the guys get discouraged, like when people around them treat them differently because of their disabilities, but they don’t let that stop them from doing what they want to do. Alexi recalled the challenges of growing up with a disability. The hardest part for him was the reactions and comments from his peers, often accompanied by laughter. But all of this taught him to accept his disability. Natalie Brophy is LSY!’s teen features editor and a student in our program at Mount St. Mary Academy.